Sugar serves both to flavor and preserve. The particular type of sugar has a significant effect on the color and flavor of the canned preserved fruits and vegetables. Sugar preserves fruits in jams and jellies. 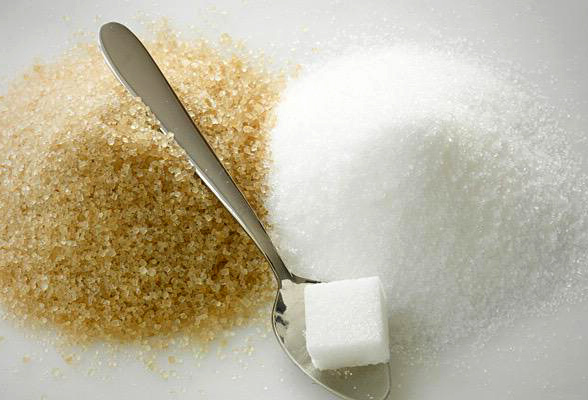 Cane sugar is derived from sugar cane and beet sugar comes from sugar beets. The extraction process is very similar for both. Both are chopped and pressed and the juice is reduced to dark-brown syrup. The raw sugar is cleaned several times and crystallized to produce granulated sugar. Honey is available in various colors, consistencies, and very different flavor directions, depending on where the nectar was gathered. This is a Canadian specialty produced from the sap of North American sugar maples and has a caramellike flavor. 1:1 = 2lb gelling sugar is added to 2lb fruit. The advantage it has over normal sugar is that the cooking time is much shorter, helping the fruit to retain its color and flavor. The high sugar content means the products keep for one to two years. 2:1 and 3:1 = the ratio of fruit to sugar can be reduced to 2:1 or 3:1. The products are then fruitier and not as sweet, but the lower sugar content means they keep only for about six months. Pectins are the natural gelling and thickening agents found in the plant cells of most fruits. Fruits contain the largest amount of pectins just before they’re fully ripe. Apples, quinces, currants, and gooseberries all contain a lot of natural pectin. Figs, cherries, peaches, and pineapple contain very little. Gelling agents are composed of pectins and citric acid. Like gelling sugar, they’re available in different concentrations (e.g., 1:1, 2:1, 3:1) and are mixed with sugar at the specified ratio.